Travelers will be relieved to have this pocket-sized medical book for when their journeys hit a bump in the road. 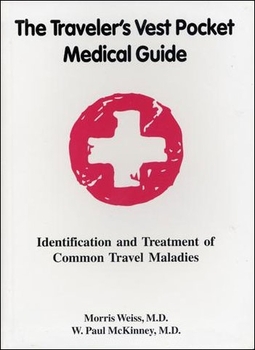 This quick and easy, step-by-step guide will show you how to treat the range of common travel maladies, including rashes, cuts, fractures, insect and animal bites, altitude sickness, digestive problems, fungal infections, chest discomfort and other afflictions associated with both adventure traveling and casual touring. The book also includes brief sections on pre-trip necessities, motion sickness, jet lag, water purity, personal hygiene, clothing suggestions and food precautions — delivering you in good condition to any exotic destination and bringing you home happy and healthy. Paul McKinney, M.D., is the V.V. Cooke Professor and Chief of the Division of General Internal Medicine at the University of Louisville. He joined the Center for Disease Control's Advisory Committee on Immunization Practices as a liaison member from the Association of Teachers of Preventive Medicine in June 1998. Morris Weiss, M.D., is a practicing cardiologist with a keen interest in archeology and travel medicine, having worked at classical dig sites around the Mediterranean.